Insurance your parent group needs for the surprises you don’t. We offer affordable insurance packages to protect against theft, injury, property damage, and embezzlement. Too often group leaders assume they are covered by their school or their school district, but the reality is that most aren’t, so it’s important to ask. Joining the PTO Today Plus community means that you immediately have everything you need to make your school great. All the informative and helpful content that you’ve come to expect from PTO Today, discounts on programs and products, support from a team of personal advisors, and first dibs on our popular sampling programs—and hundreds of new friends! * We work with lots of different partners to bring programs to our Plus community. Each program is unique and might have different geographic or demographic criteria. As a result, we may have a special promotion or PTO Today Plus perk that is offered to some, but not all, Plus members. Accidents and injuries can result in significant medical costs. Excess Accident Medical insurance provides excess medical coverage to participants in PTO sponsored events in the case of injury to the participant. The coverage is excess to any primary medical insurance the participant or the participant's guardian (in the case of a minor) may have in place. $25,000 annual limit. Note: Excess Accident Medical insurance does not replace the need for a General Liability policy. Did you know that many venues including school and municipal facilities won’t allow your PTO to hold a sponsored event without General Liability coverage? General liability insurance protects your group and volunteers against 3rd party bodily injury and property damage claims. General Liability - $1,000,000 per occurrence limit / $2,000,000 annual aggregate limit per parent organization. Must be purchased with Excess Accident Medical. Your board members are responsible for making decisions and running your group. Any one of your board members can be sued personally for a decision made by your group. D&O insurance protects board members if a “mismanagement” or “misrepresentation” claim is filed. $1,000,000 per claim and $1,000,000 aggregate limit per parent organization. It’s hard to imagine any of your volunteers stealing from the PTO funds. Unfortunately, theft from the PTO is something that many groups have had to overcome. This type of coverage replaces the stolen money so your group can continue operating business as usual. $25,000 annual limit. Must be purchased with Excess Accident Medical, General Liability, and D&O. Your group works hard to raise and allocate funds. Property insurance protects your parent group property (cotton candy machines, computers/projectors, and fundraising merchandise, etc.) against theft and damage. Imagine the cost of replacing all those rolls of wrapping paper if a pipe burst and caused water damage! $10,000 annual limit. Must be purchased with Excess Accident Medical, General Liability, Crime and D&O. Covers most events PTOs organize; get full list of events. Districts with 10+ schools get volume discounts; call for pricing. Need information to share with your board? It answers many of the common insurance questions that come up during board meetings. Think you’re covered? When it comes to parent group insurance, most people don’t know as much as they think—and that could cost them. Take the quiz to see if you know enough. PTO Insurance: Do You Need It? Without insurance, your group and your officers may be at risk. Here’s what you should know to assess your needs. Are you covered? To make sure your parent group’s insurance policy will protect members if a claim is made, there are a few things you should learn about. Having a few key policies in place can minimize the risks to parent volunteers. Who would steal from a parent group? It's a question we hear a lot. Unfortunately embezzlement does happen, and parent groups are not immune. "It is comforting to know that we, as volunteers, are covered in case of accidental property damage or injury." Download and return completed application by mail or fax. Or buy now and complete purchase online. Below are some of our frequently asked questions. If you have any other questions or concerns, please feel free to contact us via email or call ‍800‑557‑2670. Why do we need insurance—doesn't the school cover us? In many states, school districts are not allowed to cover parent groups because they are independent from the school and not government entities. There are some school districts out there, however, who might still cover the parent teacher group under their policy. The best advice is to give your school a very specific list of your activities and request a written letter from the school stating that all of your activities are covered. Some policies only cover the parent teacher group for events during school hours and on the school campus so that needs to be clearly spelled out as well. Quite often the school assumes you are covered without actually looking into the specifics. The only way to be sure is to get something in writing! We are just a parent group; who would sue us? Unfortunately, parent teacher groups are not immune from 3rd party liability or from lawsuits, even if they are incorporated. Every year, parent groups face 3rd party liability suits or are victims of embezzlement. As a parent group officer, it is your responsibility to make sure your group has sound practices to prevent potential problems. You should also ensure your group is covered in the event that something bad does happen. It only takes one bad event to erase years of hard work. How reliable are the insurance carriers you use? Bene-Marc, Inc. has over 38 years of experience administering insurance programs for the nonprofit community. Philadelphia Insurance Companies and AXIS Global Accident and Health provide coverage for the PTO program. Both companies are rated "A" by the A.M. Best's Rating. Can any parent group purchase PTO Today insurance and how does a group apply? PTO Today insurance coverage extends to parent groups associated with a single school and represented by a single board. Groups can go by any acronym, PTO, PTA, HAS, PTSO, Booster Club, etc. You can apply online at www.ptotoday.com/insurance and pay with a check or a credit card. If you do not wish to do that, you can download the application and send it to us via the mail. If you are associated with a parent group that serves multiple schools, please contact us for volume discounts. When will my coverage go into effect? Your policy can start as soon as the day after you purchase assuming we receive the completed application, payment for your membership, and your application is approved. Why do I need to be a PTO Today Plus member to purchase insurance? By pooling all our members together we're able to offer you exceptional coverage at a discounted rate you won't find elsewhere. As a Plus member you'll enjoy all the exclusive benefits of being a Plus member, including downloadable access to ALL expert guides (a $235 value), members-only library of online articles and bonus tools, and first dibs on special offers and complimentary sampling programs from our partners. General Liability provides coverage for sums that the insured becomes legally obligated to pay as damages because of bodily injury or property damage from a covered event. A good benchmark to remember is that there must be bodily injury or property damage to trigger coverage under the General Liability policy. Excess Accident Medical Coverage is required with the purchase of general liability. The General Liability policy provides sub limits for Fire Damage and Medical Payments. The Fire Damage sub limit is $100,000 and the Medical Payments sub- limit is $5,000. Fire Damage Liability provides coverage for the ensuing property damage to property, that the PTO is occupying, due to the PTO's negligence. Medical Payments is a “no-fault” coverage providing up to $5,000 for first aid administered at the time of the accident, necessary medical, surgical, x-ray and dental services, and the necessary ambulance, hospital, professional nursing and funeral services. A suit does not have to be filed in order for the PTO to receive the $5,000 benefit. Should the expense exceed this limit, the claimant would seek protection under the general liability policy. Please note that effective 7/1/10 the general liability policy contains an exclusion for incidents of actual or alleged negligent acts, errors or omissions resulting in abuse or molestation or threatened abuse or molestation. Volunteers are covered as part of the PTO under the general liability policy, as respects to their involvement on behalf of the PTO. The PTO Today general liability policy does not have a deductible. General Liability list of covered events. General Liability, Excess Accident Medical and Crime coverage are required with the purchase of Property. The Cause of Loss — Special Form is generally a broader coverage form versus a named peril policy. If it is not excluded, then the peril is covered. Coverage limit is $10,000 and carries a $250 deductible, to be assumed by the local PTO. This policy provides coverage to the Business Personal Property that is damaged from perils not excluded under this policy, with a maximum liability of $10,000. Theft or loss of Scrip is not covered by your Property Policy. General Liability and Excess Accident Medical coverage are required with the purchase of Crime. This policy contains a $250 deductible, to be assumed by the local PTO. This policy provides coverage for a covered event within the United States, its' territories and Canada. The Crime provides coverage for the officers, directors and volunteers under the above limits of liability for each insuring clause. The local PTO does not have to provide a list of those to be covered under this bond. This bond provides blanket coverage for those working on behalf of the local PTO. Provides up to $10,000 for Accidental Death Benefit. Provides a maximum of $10,000 for Accidental Dismemberment. Dental maximum is $250 per tooth with a $1,000 maximum per accident. Provides protection to your PTO and officers if someone alleges misrepresentation or mismanagement by your parent group. Covers all officers in your PTO group if sued personally for a decision made by the group. Provides $1,000,000 per occurrence for all losses arising from claims alleging a wrongful act by PTO officersCost of defense and investigation of losses included in the occurrence limit. *Please refer to the policy copy online for exact coverage details. Can I see a list of covered events? *If you have any of these activities at the vendor’s venue, the vendor must have appropriate insurance and it is strongly recommended that your parent group be listed as and additional insured on the vendor’s policy. For the following activities to be covered by your insurance the session/program must be led by PTO volunteers (not by paid instructors). Additional PTO volunteers must be in attendance at all sessions/programs. If you are paying the instructors, they must have their own coverage, and name your parent group as an additional insured on their policy. When you hire a vendor to provide any of the following activities at your event, the vendor should have appropriate insurance and it is strongly recommended they name your parent group as an additional insured on the vendor’s policy. If you have any of these activities at the vendor’s venue, the vendor must have appropriate insurance and it is strongly recommended that your parent group be listed as an additional insured on the vendor’s policy. Athletic, sports, and physical type activities or events represent extremely high potential liability to a Parent Group, and have a very high participant child and adult injury incident rate. Injuries to athletic/sports participants are not covered under this policy. The policy will not defend the Parent Group against a negligence lawsuit resulting from athletic or sports activities. Types of activities referred to within this section include but are not limited to aerobics, baseball, basketball, cheer leading, football, gymnastics, martial arts, swimming, tennis, track and field, volleyball, or any enrichment class or event involving athletic or physical type activities. The only exceptions to the Athletic/Sports exclusion are: bowling, 5K Run/Walk, Walk-A-Thon, Jog-A-Thon, Fun Run, a golf tournament, or an ice or roller skating party (indoor rink facility). Can events be held off school grounds? The policies provided cover the parent teacher group anywhere within the United States. You can hold events away from your school (exclusive of private homes) and you are still covered. Do we need to send a list of all of our events for the year? Athletic, sports, and physical type activities or events are not covered under this policy. The only exceptions to the Athletic/Sports exclusion are bowling, a running event, a golf tournament, a Jog-A-Thon, a Walk-A-Thon, a roller skating party or an ice skating party held at inside facility. An Additional Insured gives associated coverage to an entity or venue not currently named under your policy. An Additional Insured Certificate can be provided at no additional cost, should someone request it of the Parent Group for a particular event. This will satisfy the venue's liability protection need. Organizations (ex: Scouts) cannot be additionally insured to a policy. Further, Additional Insureds cannot be "open-ended"; with the exception of a Parent Group's School District and / or associated school. When an Additional Insured is intended for a specific event, details of the event must be given in writing (Email). Does the policy cover liquor liability? How do I purchase liquor liability coverage? What are the costs for liquor liability coverage? Why do I need both General Liability and Excess Accident Medical? The combination of general liability and excess accident medical coverage is important for groups to ensure the groups satisfy the insurance requirements of school districts and venues where PTO-sponsored events are held. General liability insurance provides coverage in the event of a third party bodily injury (non-participant injury) or property damage claim. In addition, the excess accident medical coverage provides coverage to participant injury during PTO-sponsored events. What are the limits for each coverage type? D&O - $1,000,000 per claim, $1,000,000 aggregate limit per parent organization. Property - $10,000 annual limit. What are the deductibles for the policies? The only policies that have a deductible are the Property, D&O and the Crime policies. The deductible for D&O is $2,500. The deductible for Crime and Property is $250. Can I see a copy of the policies? Who is covered under the General Liability policy? General Liability provides coverage for included/covered events to your entire parent group — all the volunteers and members. Excess Accident Medical must be purchased with General Liability. Who is covered under the Excess Accident Medical policy? Excess Accident Medical covers your entire parent group - all the volunteers and members and anyone attending a PTO sponsored event. Who is covered under the D&O (Officer's Liability) policy? D&O covers all the officers of your group in the circumstance they are sued personally for a decision made by the group. The D&O policy has a $1,000,000 limit per claim, $1,000,000 aggregate limit per parent organization, and a $10,000,000 annual aggregate limit for the Purchasing Group. How is General Liability different from D&O (Officer's Liability)? General Liability protects your group from 3rd party bodily injury and property damage claims arising out of your sponsored events. The coverage “trigger” occurs when there is property damage or bodily injury at a covered event. For example, if a third party is injured while participating in a PTO sponsored event, a claim could arise that should be filed under the General Liability policy. A General Liability claim could also arise from actions of a PTO member who damages school property. D&O Liability specifically excludes bodily injury and property damage claims. D&O protects your PTO and your officers if someone alleges misrepresentation or mismanagement of your parent group. If PTO officers hire a company to provide bounce houses for a back to school kickoff, but fail to verify insurance or undertake any due diligence regarding the vendor, and an incident occurs involving the vendor, the Officers could be sued personally for their decision to hire this uninsured vendor. There does not have to be bodily injury or property damage to trigger a D&O claim. In fact, if the claim alleges either bodily injury or property damage, the claim should be filed under the General Liability. What is covered under the Property policy? Property coverage extends to any personal property of the parent teacher group, such as computers, popcorn machines, and fundraising merchandise. If you “gift” an item to the school, however, that item would be considered school property and covered under the school's insurance policy. Excess Accident Medical and General Liability must be purchased with Property insurance. Who is covered under the Crime policy? The Crime policy is a blanket bond that covers anyone who your organization trusts with the money. This can be a President, Treasurer, Committee Chairperson or Volunteer. Why is General Liability and Excess Accident Medical required when purchasing Crime? Please note that the insurance options effective 7/1/10 have changed. If a PTO group is seeking crime coverage effective 7/1/10 or later this coverage will be automatically paired with General Liability and Excess Accident Medical coverage. Why does Crime require an audit and other controls? The best thing you can do to protect your group's money is to put in place sound financial controls. Insisting that someone who does not sign checks reviews the bank statement will help to protect your organization from having a loss, as well as limit the dollar amount of the loss through early detection. The person who doesn't have check signing authority basically needs to date and sign the monthly bank statement indicating it has been reviewed. The audit does not need to be done by an accountant, just an independent person who understands the process. 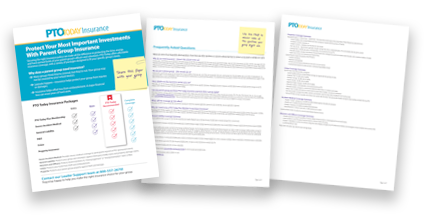 PTO Today's Treasurer's Toolkit has several other helpful financial controls to help you safeguard your money. Can the treasurer do the bank reconciliation? Yes, the treasurer can reconcile the bank statement. It's important, however, to have someone else review the reconciliation to make sure it was done properly. In addition, you must conduct an annual audit of the books by an audit committee or a qualified accountant and the monthly bank statement must be opened/reviewed by someone who does not have authorization to sign checks. You might want to consider Finance Manager (www.ptotoday.com/finance-manager/) to make bank reconciliation easy. Since Finance Manager is a web based software program, your financial data is accessible to anyone with the right permission level. This makes reviewing the bank reconciliation a very simple process! What does it mean to "gift" something to the school? When you donate or “gift” something to the school and they accept the gift, then the school also accepts responsibility for those items and it further separates your group from liability. This is quite often done with playground equipment and similar types of items. Please remember that “gifting or trusting” items to a school will provide some defense in court but cannot stop someone from filing a lawsuit. Can I cancel a policy? Can our PTO sponsor a Boy Scout or Girl Scout troop? If your bylaws allow this, the boy/girl scout troop must list your PTO as an additional insured on its general liability policy. Once a claim is filed, your PTO group will be notified by Philadelphia or ACI (depending on the type of claim) with respect to acknowledgement of the receipt of the claim and clarification if additional information is needed from your organization. *The Certificate of Insurance won't arrive within 24 hours but your policy can start as soon as the day after you purchase and we receive the completed application and payment for your membership, and your application is approved.